Marcel Sutter met the Arnold family when he was 22 years old, after his studies to become an engineer were interrupted by the outbreak of World War II. Within a short time he became a brother, friend, teacher, and role model for 11-year old Simone. Whenever he visited, he would ask Simone to play Mozart or Schubert on the piano. After Simone’s father, Adolphe, was arrested, Marcel was a source of spiritual strength and friendship for Simone and her mother, Emma. He encouraged Simone to continue her piano lessons, which helped ease her anguish at the absence of her father. 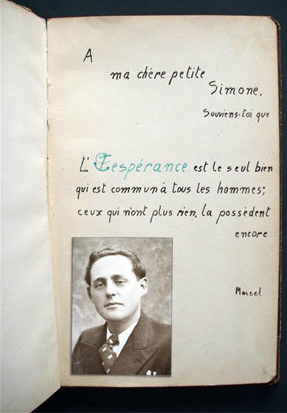 Marcel bought Simone a poetry book, which she called her “golden book.” At that time the term “golden book” was used in Europe for a book that collected cherished comments from friends. 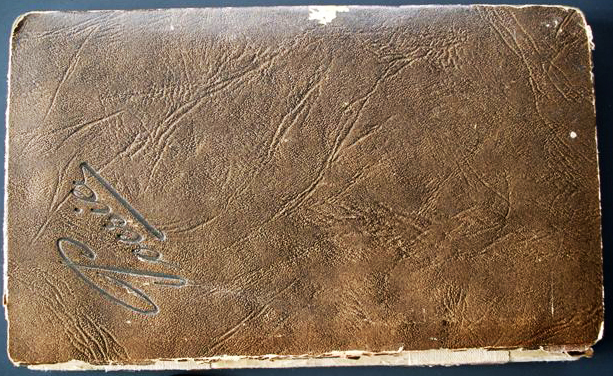 Marcel was subsequently arrested and imprisoned for refusal to join the German army. He was beheaded as a conscientious objector on November 5, 1943 in the Roter Ochse fortress in Halle at the age of 24 years old. The Roter Ochse fortress now has a permanent exhibition in memory of all those who were executed there. Marcel Sutter’s name is on the list of victims. >> more information about Roter Ochse Memorial. Photo added at a later date because the original was lost. >> more information about Marcel Sutter.